Hello Games promises the Joe Danger sequel will feel like a combination of Rambo, Short Circuit, and The Goonies. The sequel to Hello Games' Joe Danger will allow players to create their own action film, scene by scene. 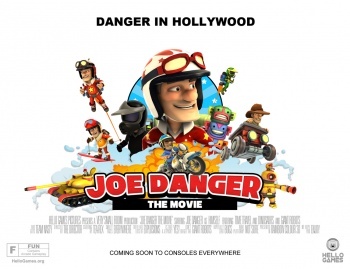 Titled Joe Danger: The Movie, this new game will see the biker please audience members with perfectly-executed stunts, or crack them up with failed attempts. "Picture every film you've ever loved as a kid...all cut together into some crazy montage, and that's basically the script for our game," said Sean Murray, the studio's managing director. The first game, which was released for the PS3 in June 2010, earned positive words and a four-star review from The Escapist. It tasked players with getting Joe back into the stunts business after a debilitating injury. Now, at the peak of his skills, a "mysterious Hollywood director" contacts Joe for some additional work. This is where the sequel begins. "We've kind of gone a bit crazy in terms of ideas and scope," Murray added. "If you liked Joe Danger, then I think it's going to rock your world." Joe Danger: The Movie will be seen for the first time at Gamescom Cologne, and later at PAX Prime. No release date has been given, and though the last game was a PSN exclusive, there's been no word regarding supported platforms.